Produced in association with Glasgow Museums. The Anchor Line was one of the great shipping companies of the Clyde. It was famed for its sleek, luxurious liners operating between Glasgow and New York, and for its smart steamers sailing to India. For many years its beautiful, black-funnelled transatlantic liners were the largest ships sailing regularly from the Clyde, and they came to symbolize the romance of Glasgow�s powerful shipping and shipbuilding industries. 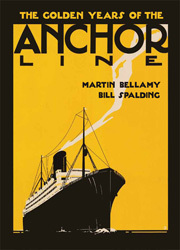 This unique book combines Glasgow Museums� fabulous collection of Anchor Line material with Bill Spalding�s own personal collection to trace the company�s history from emigrant carrier to cruise operator. It uses period images and the personal narratives of passengers and crew to give a compelling insight into this famous shipping line. A unique glimpse of a time when Glasgow�s docks truly were the gateway to the world.